Social media is one of the best ways to help marketers share their content. Just how popular have these channels become for content distribution? According to 2016 research from CMI and MarketingProfs, B2B marketers distribute content on an average of six social media channels, and B2C marketers use seven — that’s a lot of shouting from the treetops. But tracking your audience through the social media jungle is not for the faint of heart — plenty of perils can befall a foolhardy brand that enters these environments unaware and unprepared. Active social communities can be tough for brands to penetrate under the best of circumstances; so if you find yourself trying to forge a path tangled with Vines and Vimeos (see what I did there?) without a sound strategy, your efforts might end up requiring a rescue helicopter rather than an ROI calculator. Content hub: Your blog or website should be a key component of your social media content strategy, as this is where you would direct followers in order to forge a deeper relationship on a media platform that you own. Adequate resources to keep a consistent presence: It looks far worse when brands abandon their social outposts than when they don’t build a presence at all. Before committing to any platform, make sure you are prepared to sustain your efforts for as long as your audience is looking to connect with you there. Once you’ve outlined your social media content plans and purpose, you’ll have a much easier time deciding which platforms will bring you closer to your destination. 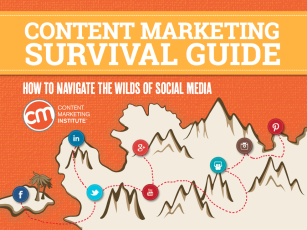 And to help you explore the possibilities in even more detail, we’ve put together a new e-book: The Content Marketing Survival Guide: How to Navigate the Wilds of Social Media. Which platforms enable businesses to host live interactive events? On which platforms can marketers enhance their content with rich-media features and functionalities? When might it be more advantageous to post a video on Vimeo rather than YouTube? On which platforms is it recommended that you monitor conversations for a while rather than immediately contributing to them? Where will organic reach be strong enough to meet your needs, and where will sponsored opportunities be your best bet for reaching the right audiences? You’ll also find a handy cheat-sheet template to help you build your content plan, and a snapshot of which platforms B2B and B2C businesses are using, and which ones they are experiencing the most marketing success with. Read How to Navigate the Wilds of Social Media to improve your sharing strategies and drive higher engagement rates for your content efforts. If you find it helpful, we’d love it if you would share it with your friends through your preferred social media channels. After you download the e-book, subscribe to the daily CMI newsletter for ongoing tips, advice, and trends around content marketing and social media.